Marketing of public library services is notoriously difficult. We offer so much to so many people, when designing a marketing campaign it’s hard to know where to start! So when we decided we wanted a new marketing campaign to change people’s perceptions of modern public libraries, we knew it had to be fresh, exciting and high profile. We also wanted to align our online and offline marketing so our offer was more ‘joined-up’ across promotional channels. The #whatsyourstory campaign was launched in late June 2015. It was designed to be fun and appealing to adults living in Leeds to inspire them to engage with the library service. The campaign features real people telling their personal stories about the positive impact Leeds Libraries has had on their lives. A maximum budget of £10k was allocated to the initial stages of this campaign. This included concept, design and plan execution. Lamppost banners, a billboard, press and TV coverage, a website, blog posts and print flyers all accompanied a comprehensive social media campaign. You couldn’t move in Leeds without seeing something relating to #whatsyourstory – it was incredible! Traditional media channels were interested in #whatsyourstory because of the stories of Wayne Levitt and Ma Maposa. These two people provided the inspirational case studies that featured in the first phase of the campaign. #whatsyourstory generated 20 pieces of media coverage during its launch including two articles in the Yorkshire Evening Post, a broadcast feature on Made in Leeds TV and many more articles in local publications. The potential audience reach of the local media outlets is over two million people. One feature in particular included an interview with Cllr Debra Coupar, which included many library-related issues beyond this campaign, thus fulfilling more objectives than were originally planned. In addition to this, good relationships have been formed, with local papers indicating they will be keen to feature library features of this kind in the future. Ma himself already had a good social media profile, and by working with him, the library reached a brand new demographic that would have been difficult to reach otherwise. Besides reaching new audiences, we wanted the social media element of the campaign to promote engagement and interaction. Throughout the four weeks of the campaign, we had 365 interactions via social media for #whatsyourstory content. One of the most popular tweets was a photo of Ma’s billboard, which was erected on a popular commuter route between Leeds and Bradford. The campaign received great support on social media from Leeds residents, businesses and organisations as well as other Leeds City Council departments and staff. The impact of #whatsyourstory reached far beyond Leeds, with positive interactions from Australia, Canada and the USA! Also we have noticed the images being used in presentations at numerous conferences. Our social media engagements increased throughout the campaign and, as a result, we gained more followers and raised our social media profile. Wayne and Ma’s stories were posted on our Leeds Reads blog and were by far the most popular posts of 2015, gaining 120 shares on social media. Another outcome we wanted to achieve was an improved profile of Leeds libraries within council audiences. During the campaign we recorded interaction from a range of accounts, including a large number of council departments, the most influential being from the CEO of Leeds City Council. 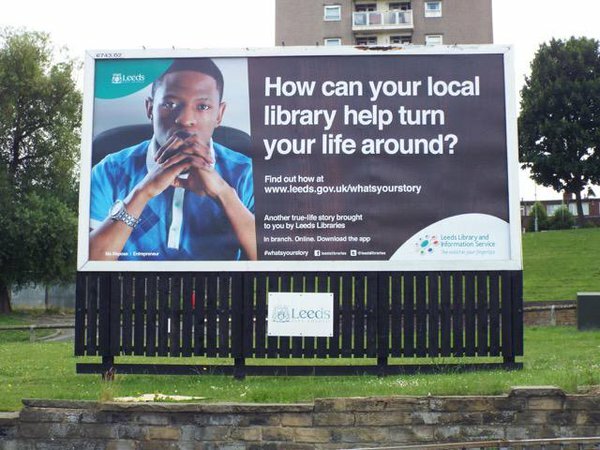 Of the main objectives set at the start of the campaign, improved online engagement with users was clearly achieved, with awareness of Leeds libraries brought to the attention of new demographics. And in preparation for future campaigns, good relationships were built with main stakeholders. The next phase of the #whatsyourstory campaign will be launched in early 2016 with two new case studies. To keep up to date with activities in Leeds libraries, follow them on twitter or sign up to their blog. The usual sort of politically correct drivel I'd expect from anything associated with Leeds and, indeed, librarianship. And I say this as someone who lives in Leeds, and as someone uninspired by Leeds libraries, to say nothing of my long spell in librarianship.